I like original comic art a lot, but there are problems with collecting it. It gets expensive quick and before you realize it, you’ve run out of wall space to display things. Back in 04 I got the idea to start a sketchbook. Now I had seen some amazing books online, so I knew I wanted a theme. 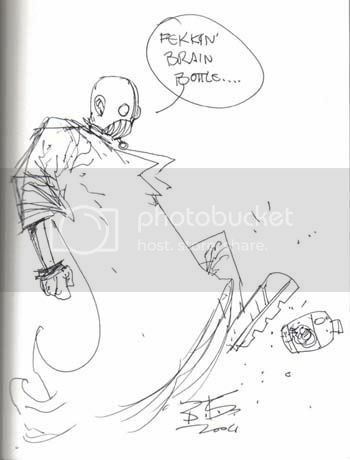 At the time I had grand illusions of writing a few web comics and using a brain in a jar as the logo. So I figured I’d get some of my favorite characters interacting somehow with a brain jar. This has made it very hard to set up with some characters but so far has gotten some pretty amazing results. The link to my sketchbook is on this blog, so you may have already seen the sketches. But I figured I’d take one sketch a week and tell the story behind them. Some of them are pretty funny. Some may just introduce a comic or character you aren’t familiar with. Check out after the jump to see the first sketch. So there I am back in 04, I had just bought an empty sketch book, excited with the possibilities. 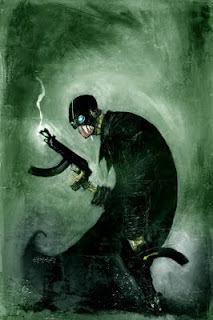 Then I find out my local shop at the time, Coliseum of Comics is having Ben Templesmith at their shop. I was thrilled; I loved his work on Criminal Macabre, enough that I had bought two of the pages. I also had picked up all of his Singularity 7 series. I had talked to Ben on his own board enough to know that he enjoys tequila, so on the day of the signing I grabbed my book and a bottle of tequila. The turn out was way small, so I got to talk to him for awhile and got the quick sketch of Gunnar from Singularity 7. I figured it was best to go with the character he had created. Sadly he was horribly jet lagged and going to the airport right after the signing so the tequila didn’t get used the way I had intended. I ran into Ben at another con a year or so ago. When I showed him my book he had wanted to redo the sketch, but I wouldn’t let him. It might be simple but I think that it is part of the charm. As a side note I did a Gunnar costume one year at Dragon Con. Was the first time I’ve seen people freaked out by a costume there. So that is the first sketch in my book. Isn't it wonderful? I think this will be a weekly thing until I run out of sketches.